With busy children, parental roles expanding with work, chauffeur, doctor, and chef duties, it seems as if there is less time to spend each day with family even during the summer. Involving the entire family at meal time will help transform dinnertime into a special time where children are invited into the kitchen to help prepare delicious, fun, family recipes. Here are some tips from Janet Andreas, Home Economist and Director of the French’s Test Kitchen that will help create quality family summertime dinnertime. · Set the mood by establishing dinnertime as a priority for the family. · Try to plan meals in advance and set a regular dinnertime. Dinner doesn’t have to be at the same time every night, but let everyone know when dinner will be served. · Keep family dinners interesting by serving meals that everyone helps prepare. 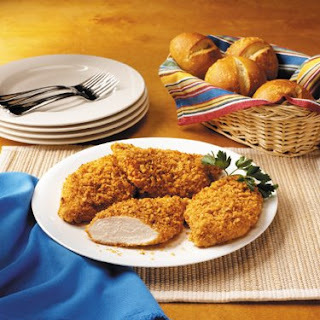 · Create new variations on family favorite recipes like using crushed French’s French Fried Onions, instead of breadcrumbs as a coating for chicken, pork, or fish. · Serve dinner with enthusiasm and use dinner time to create genuine, heart-felt conversation with each member of the family. · Try to integrate changes gradually so your family is “freaked out” by family dinner. Try new things each week and see what works best for your family. Here are some quick, simple and delicious dinner recipes that are easy enough that the kids and dad can even make them. Place French Fried Onions into plastic bag. Lightly crush with hands or with rolling pin. Bake at 400ºF for 20 minutes or until no longer pink in center. Place French Fried Onions, lemon zest and garlic in plastic bag. Crush onions with hands or rolling pin; shake to combine. Place flour in another plastic bag. Add fillets; shake to coat. Dip fillets into egg, then into onion crumbs. Place on baking sheet. Bake at 400ºF for 10 minutes or until fish flakes easily with fork. Dip pork chops into beaten egg; then coat in onion crumbs. Place pork chops on baking sheet.